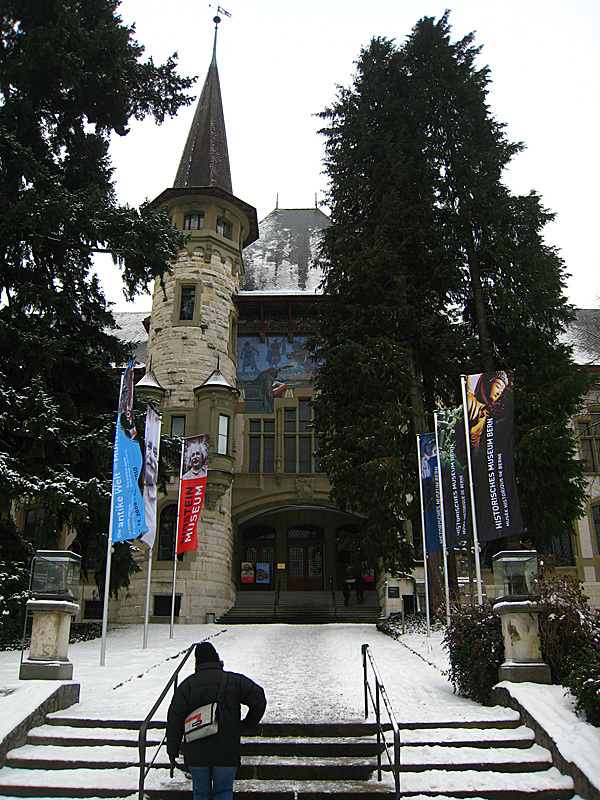 On my last full day in Europe, Désirée was nice enough to drive me to Bern to spend the day. But before we left, we checked out Jamie’s kindergarten. It was really big and super clean with all new looking desks and whatnot. Very cool. Reminded me of being in kindergarten. 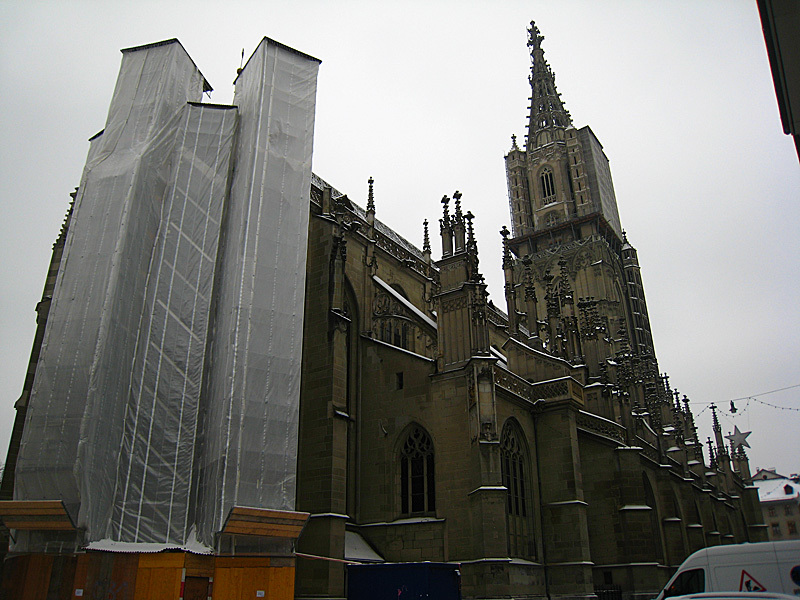 Unfortunately, because of child protection laws I am not supposed to put any of the photos I took there on this blog. So I can show them in person though sometime later. Looking down at Lower Bern from the Parliament Building. Me standing in front of parliament. And it says what CH stands for: Confederations Helvetica. So Désirée and I decided to just walk around for a bit and check out the tourist attractions. 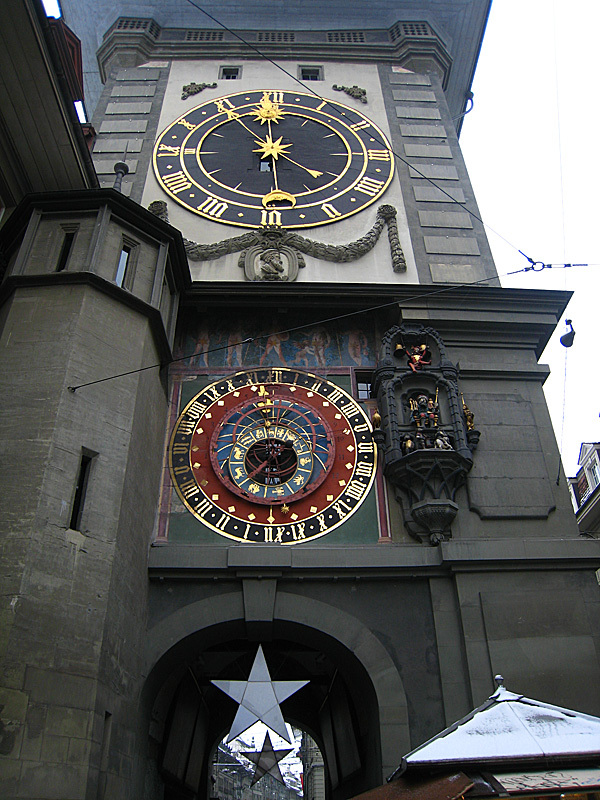 It looks like Switzerland even has its own Astronomical Clock, on the Zytglogge Clock Tower. 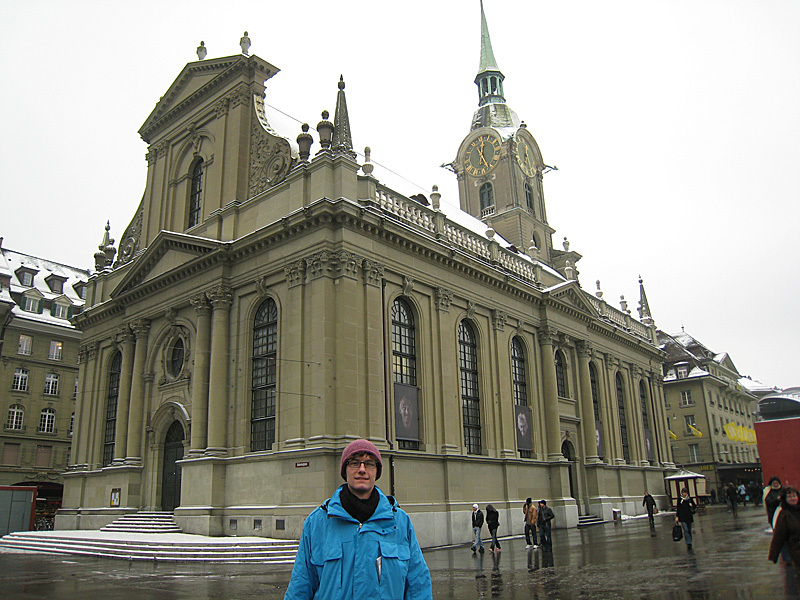 Me in front of HeiliggeistKirche. Désirée is helping out and taking photos of me. 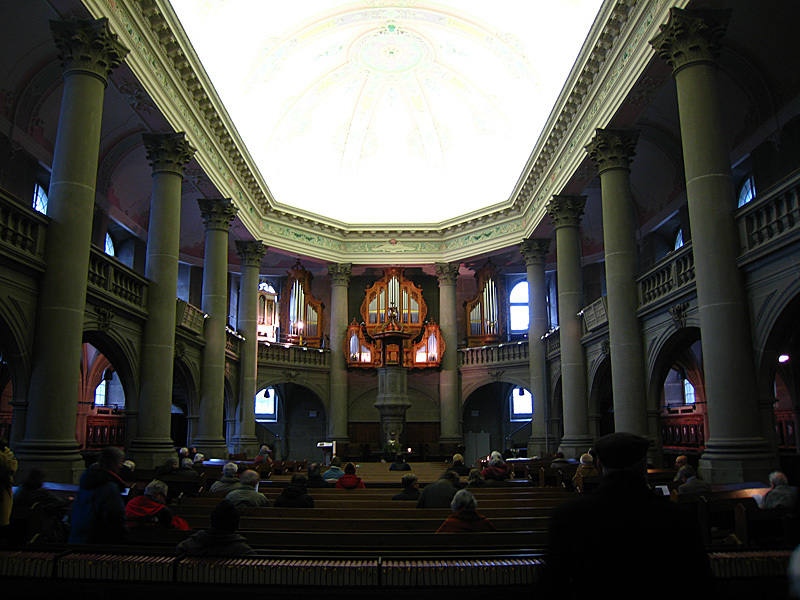 Inside the Heiliggeist. Check out that organ. 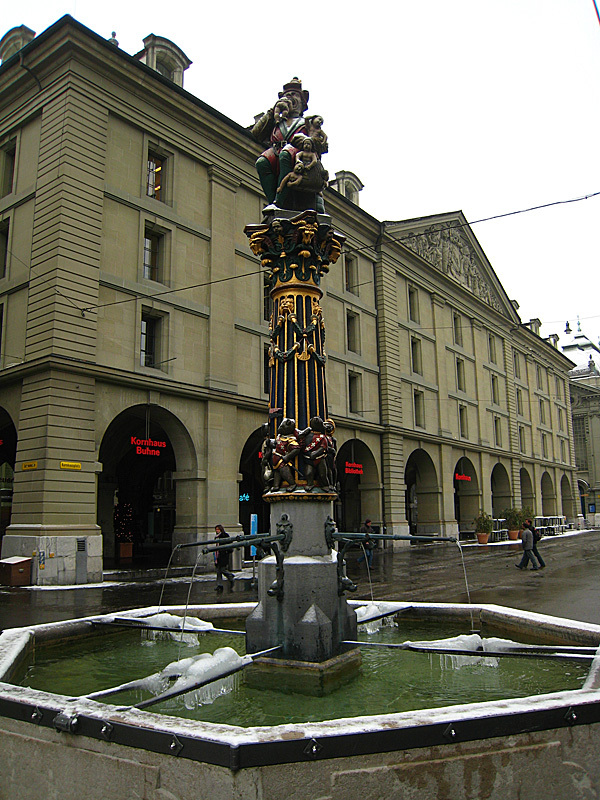 The famous fountain of the child eating man. 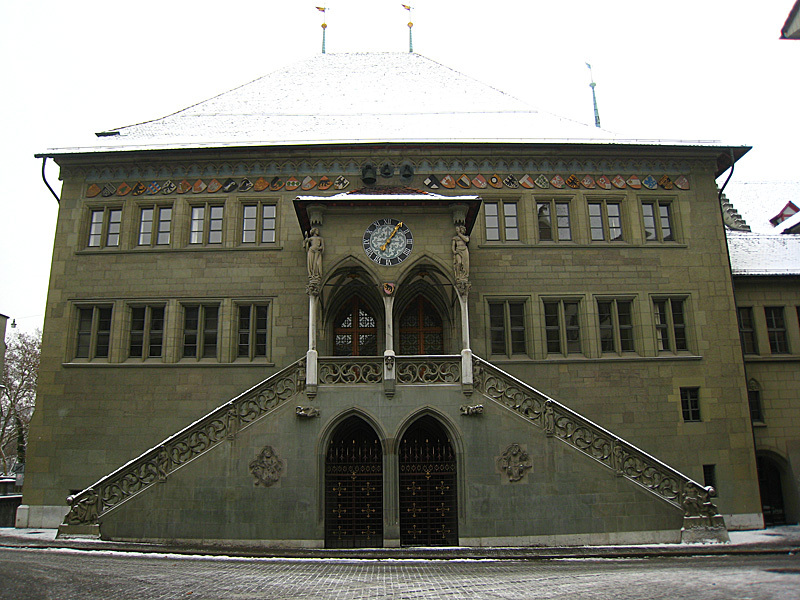 The Bern Rathaus. Most of the canton's coat of arms hang up on the wall. 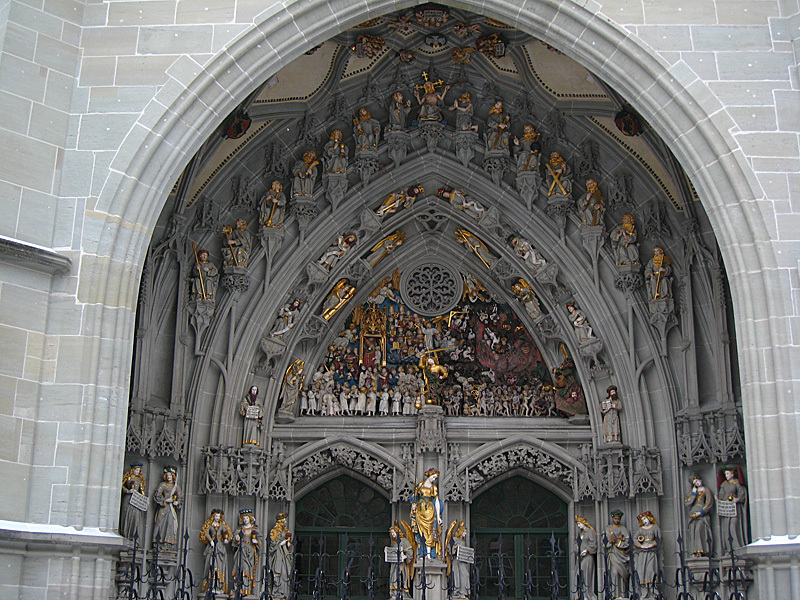 Münster Cathedral, Bern's largest cathedral. Unfortunately, it was closed but check out that decoration. Hell on the right, and Heaven on the left. Then we crossed the bridge to look at the bears Bern has in the bear pen. But they were nowhere to be found. Probably, they were inside staying warm like any sane man. 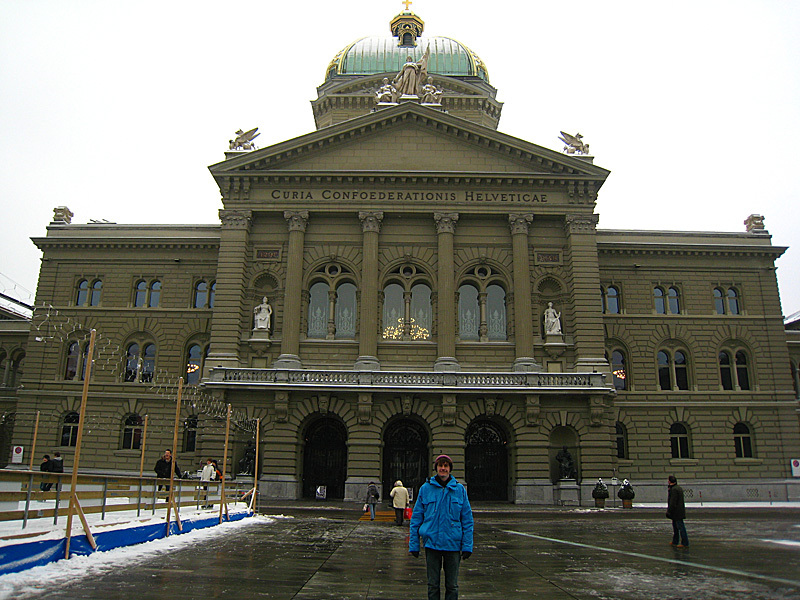 It was windy in Bern and I was getting cold. Then we went back to the center and grabbed some lunch from a street vendor. And waffles afterward. I got cinnamon on mine. Delicious! 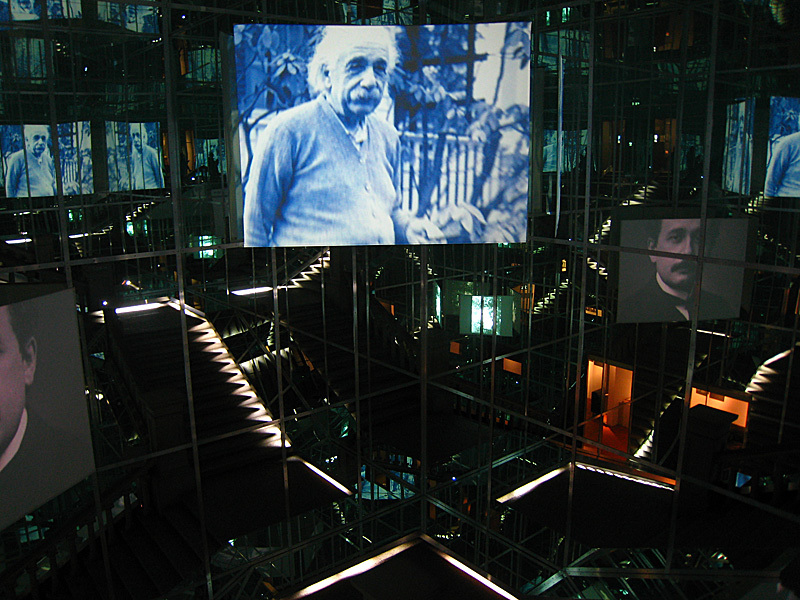 Next we went to see the Einstein Museum. There was a whole exhibit on his life and about events going on at the same time and how they interacted with his life. 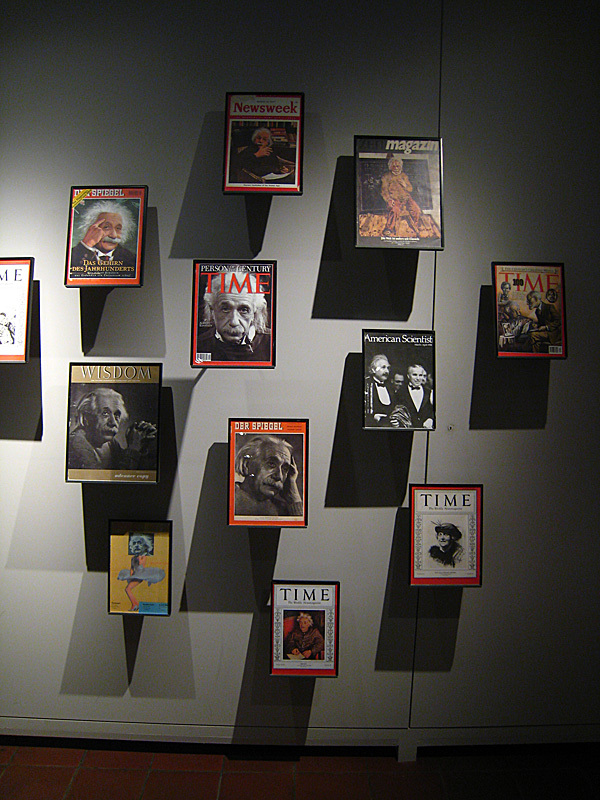 Einstein on the cover of magazines. Times Man of the Century in 1999. Exhausted after this museum trip, we headed back to the car to drive home. 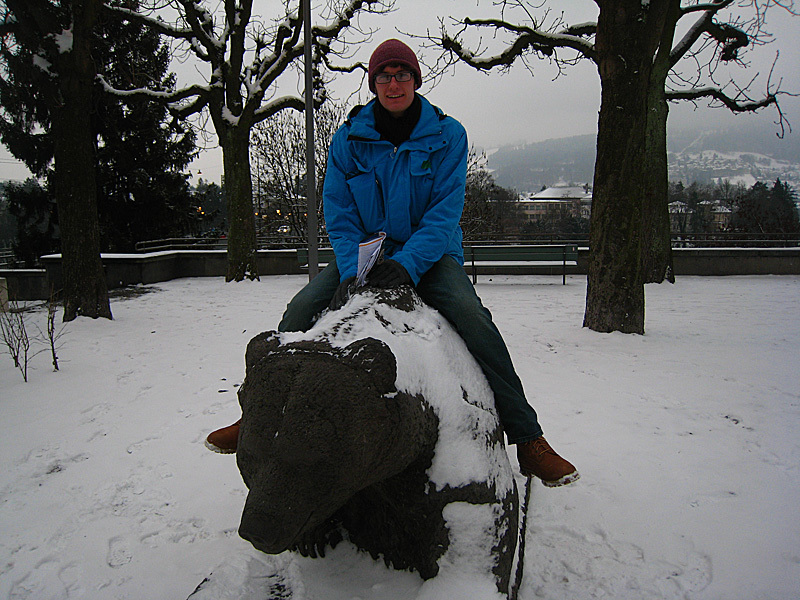 We finally found a bear in Bern. 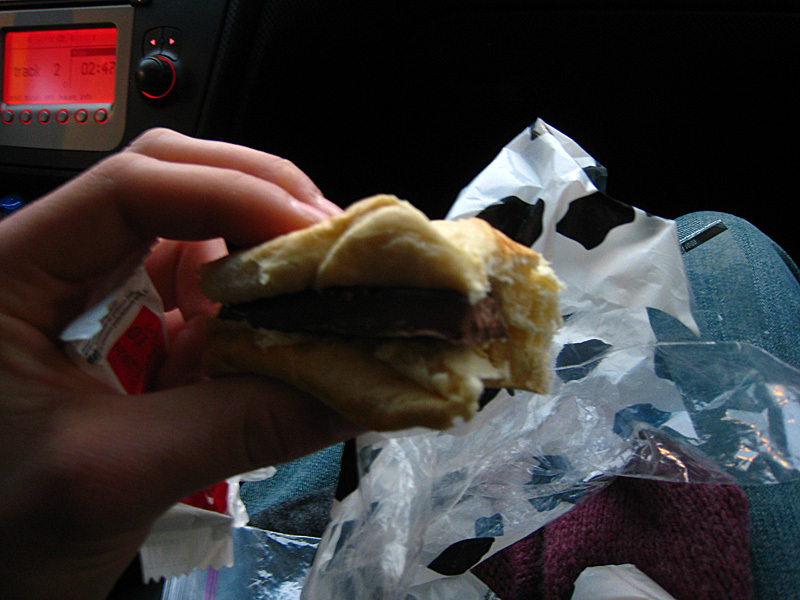 I got hungry again on the way home so I made a chocolate sandwich. I'm sure this is how the guy who invented Nutella got the idea. Then I fell asleep a couple of times on the way home in the car. Kind of unfair because I slept on the way there as well. But Désirée wouldn’t let me drive despite my offers. She dropped me off at her house before picking up Jamie and coming back. Désirée, Marcel, and I had dinner (Jamie already ate) and then we watched the very motivating movie “Remember the Titans” in German. It was still motivating. So I decided to stay up all night and finish this blog. As tomorrow, I fly home.